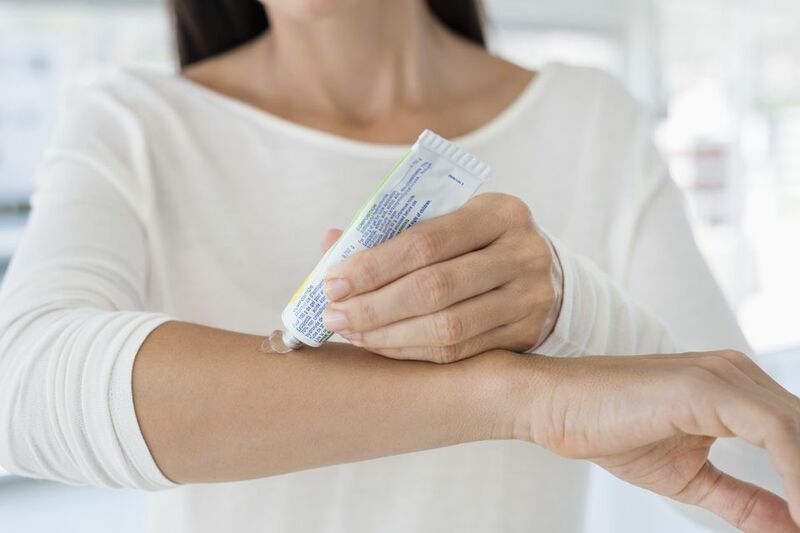 Greasy prescription creams, petroleum jelly, ointments, and salves are meant to soothe the skin and help us feel better. But they often leave greasy stains on clothing and linens. Learn how to remove stains like Vaseline, Neosporin, Vicks VapoRub, Aquaphor, and other ointments from clothes and linens. When a blob of Vaseline or ointment lands on fabric, use a dull table knife or the edge of a credit card to lift away as much of the ointment as possible from the fabric. Don't rub because you'll just push the ointment deeper into the fibers and make it more difficult to remove the stain. After removing the excess ointment, if you don't have time to treat the stain right away, sprinkle the greasy area with a bit of cornstarch or talcum powder to absorb the oil. When you are ready to wash the garment, treat the oily/waxy component of the stain with a stain remover spray or gel that contains the enzyme lipase that will help break down the oil. This is particularly important for stains on synthetic fabrics like polyester that tend to trap oily stains. Work the cleaner into the stain with your fingers or a soft-bristled brush. If you don't have a stain remover, then use a heavy-duty liquid detergent (Tide and Persil are considered heavy-duty) that contains enough stain-lifting enzymes to remove the oil. Allow the cleaning solution to remain on the fabric for at least fifteen minutes then scrub stain lightly with a soft brush and rinse the area in hot water. Finally, wash the stained item as usual in the hottest water recommended on the garment care label. Check the stained area before placing the garment in the dryer. The high heat from a dryer can set the stain and make it nearly impossible to remove. If a stain remains, repeat the stain removal steps. If the ointment is tinted, you may need to do some additional work to remove any traces of the dye. Mix a solution of oxygen-based bleach (brand names are: OxiClean, Nellie's All Natural Oxygen Brightener, or OXO Brite) and cool water following the package directions. Completely submerge the entire garment and allow it to soak for at least eight hours. Check the stain for any traces of dye. If it is gone, wash as usual. If it remains, mix a fresh oxygen bleach solution and repeat. Again, remove any blobs of ointment from the surface of the fabric with a dull knife or spoon. No rubbing! Blot the area with a dry white paper towel. As with any stain, the sooner the fresh stain can be treated, the better the chances of success for removal. So, head to the dry cleaners as soon as possible and point out and identify the stain to your professional cleaner when you drop off the garment. If you are using a home dry cleaning kit, be sure to treat the stain with the provided stain remover before putting the garment in the kit's cleaning bag and tumbling in the dryer. When the blob of ointment falls, lift away as much as possible with a spoon or dull knife. Don't wipe it up because that only pushes it deeper into the fibers of the carpet. Next, you can use a commercial carpet cleaning solution or mix one tablespoon of dishwashing detergent in two cups of cool water, stirring well to mix. Dip a clean white cloth or paper towel into the solution and wring lightly. Working from the outside edge of the stain toward the center (this helps prevent spreading the stain even larger), sponge the stain with the cleaning solution. Continue blotting until no more oil or color is transferred from the carpet to the cleaning cloth. Dip a second clean white cloth in plain water and sponge the stain to remove any traces of the cleaning solution. If you don't do this step, the detergent solution can actually attract more soil. Finish by blotting with a clean dry cloth and allow the carpet to air dry. When dry, vacuum to lift carpet fibers. The same steps can be used to remove stains from most types of upholstery. Always use the least amount of cleaning solution as possible to prevent over-wetting the fabric and cushion filling. For silk and vintage fabrics, consult a professional cleaner or if you need more stain removal tips.